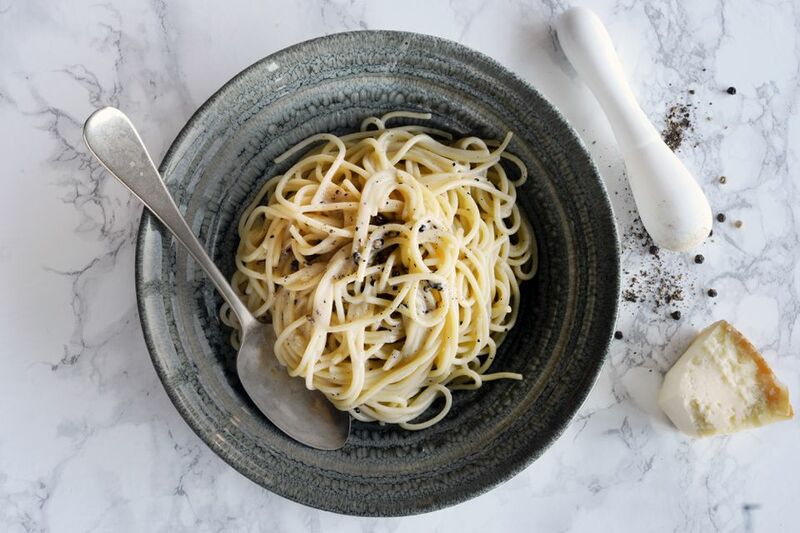 It's true: You can have a delicious dinner on the table in 15 minutes with this staggeringly quick three-ingredient cacio e pepe (cheese and pepper) recipe. Simply boil a pot of spaghetti, grate a chunk of cheese, and crush toasted peppercorns. The result is a creamy pasta sauce that packs a punch, thanks to the coarsely ground black pepper. Cacio e pepe originated in Rome, and though simple in its making, relies heavily on the quality of ingredients. The cheese must Pecorino Romano; nothing else will work as well. Seek this out, you will be glad you did. Pecorino is salty and tangy, but more importantly melts very quickly—which is what makes this recipe so quick to make. Use regular spaghetti, but if you can find it, tonnarelli, also known as spaghetti alla chitarra, will make for a thoroughly authentic experience. Heat a heavy skillet on the stove over high heat. Tip in the peppercorns and gently shake the pan over the heat for 1 minute. Transfer the peppercorns to a mortar and pestle, and crush well; you do not want a powder, the peppercorns should have a little bite to them. Set aside. Bring a large pot of water to a rapid boil, and add the spaghetti or your chosen pasta. After 5 minutes of cooking, pour 1½ cups of the cooking water into a large, heat-proof bowl and allow to cool for 2 to 3 minutes. Let the pasta continue cooking according to the package instructions. While the pasta is cooking, using a small whisk and whisking continuously, slowly add the water to the cheese to create a thick creamy sauce. Very hot pasta water will not melt the cheese more quickly—it will actually cause it to separate and become rubbery. Make sure the water is hot, but not so hot that you can't dip a finger in without discomfort. Whisking it in at this temperature will help the cheese melt slowly, and become light and creamy. You'll get there, it just takes a little time. Once you have your creamy sauce, add almost all the crushed pepper, reserving a little for garnish. Once the pasta is cooked, drain it and tip into the bowl with the cheese and pepper sauce. Stir thoroughly to coat. Serve immediately with a little extra pepper in your heated bowls, twist it up on your fork, and enjoy.